A guide on adding automated spreadsheet actions. 2. ARGUMENTS - consider this section the *required pieces that are necessary for an action to be completed. If you're sending an email, for example, you need to write a subject, message, recipient email address and source email address. 3. CONDITIONS "WHEN" - this is where you specify the "WHEN" you want the trigger/action to take place. Think of it this way: When cell A1 is greater than 20, send me the email. Whenever a specific cell is updated. In this case, we are saying that whenever cell D1 on sheet Dashboard! = 20, then send an email. 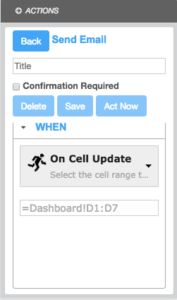 In this example, Factivate will send an email when cell D1 on Dashboard! tab exceeds 20. 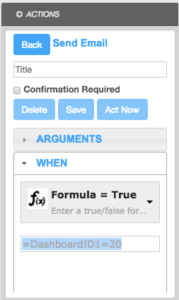 These formula functions are especially useful if you are trying to control spending or inventory in real time. 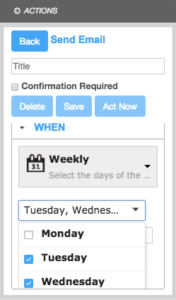 In this example, Factivate will send an email every Tuesday and Wednesday. These type of formula actions are useful if you want to send a reminder every week to your team to review KPIs before the meeting, or even if you want to tell your client his/her report has been updated and is available for their review. In this case, the spreadsheet will send an email every 2 days, regardless of formula/cell/or changes in the spreadsheet. 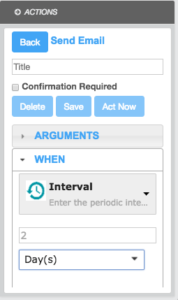 One way in which Factivate users employ the interval action is by sending an email to a user every day to remind them of reviewing their KPIs. This action is triggered whenever a a cell update happens. It does not matter if it's updated manually or automatically. In this case, you want to monitor all cells D1 through D7 for any changes. If another user manually changes that number or if the result changes, you will receive an email. In this example, Factivate will send an email whenever any cell(s) from D1 to D7 on the Dashboard tab change. These formula functions are especially useful if you have pricing assumptions/numbers that you need to control and ensure that they're not changed after you share your file with other people.